Going Baroque... Baroque Motifs is a series of 3 classes - also available as Stamps in the Mail. The first class will contain the beautiful new Baroque Motifs stamp set along with the new In Color Groovy Guava. Other new products and supplies will be added each of the next two months but always focused around this stamp set. Cost each month is $40 PLUS $5 shipping, payment is due before materials will be shipped. 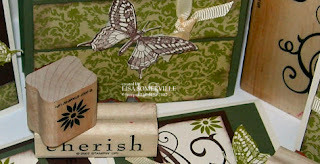 Each month you will make 4 projects that are focused around this set and the other products you receive for that month. Card stock and embellishments will be cut in advance and mailed directly to you with directions, a finished picture and templates if needed. I'll also send you a list of additional supplies needed for your projects, should you choose to purchase them. If items are used from other stamp sets, they will be pre-stamped and added to your packet. Email me today to reserve your spot for these creative classes!